The conservative explanation for state budget deficits is that employee compensation for public-sector workers is out of control. But a close look at the facts demonstrates these claims are unjustified. Public-sector pay is not the cause of state budget deficits because public-sector compensation did not significantly increase in recent years. Instead, state tax revenues declined sharply amid the Great Recession—shortfalls made worse in some states by ill-advised tax cuts for businesses and the wealthy, as happened most famously in Wisconsin before its governor began pushing to eliminate public-sector collective bargaining rights. To be sure, most states face severe budget problems—an average projected shortfall of 16.9 percent of fiscal year 2012 budgets. And there are some headline-grabbing cases of government employees receiving excessive wages and benefits. But budget shortfalls today were largely driven by the downturn in state revenue due to the Great Recession. State revenue is 12 percent below prerecession levels even as the demand for services and benefits such as unemployment insurance is high. Indeed, an examination of state employee compensation shows just how little it has to do with state budget problems. Several previous studies find that public-sector employees make less than workers in comparable positions in the private sector. Public employees do have better health care and pensions—often needed to attract qualified employees to state government jobs such as police and firefighting. Even still, public-sector wages are significantly lower than those in the private sector, so total employee compensation is lower than in the private sector. 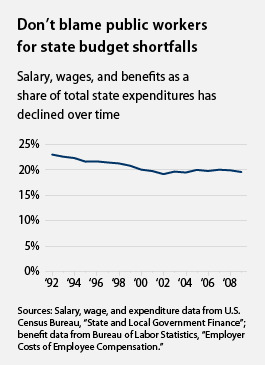 In addition, according to our analysis of state government expenditures, total state employee compensation, including wages and benefits, has not increased as a share of total state budget expenditures over the past 20 years. In fact, it has slightly decreased (see chart). The upshot: State government workers are not taking an ever larger share of state budgets as conservatives claim, but instead receive less of state budgets today than they did 20 years ago. So what to make of conservative rhetoric that misidentifies employee compensation of public-sector workers as the cause of today’s state budget problems? The evidence overwhelmingly suggests that conservative attempts to restrict public-sector union rights and slash government employee compensation are driven by motives other than budget necessity. What’s worse, our analysis finds that attempting to close budget deficits by reducing employee compensation would result in extremely harsh measures that would be very damaging to state economies. Closing all state budget deficits by only reducing employee compensation would result in either a 22 percent reduction in compensation or, if workers were laid off, the loss of approximately 1.6 million state government jobs. The national economy is down 7.5 million jobs since the start of the Great Recession in December 2007. Cutting an additional 1.6 million jobs—not to mention the additional employment those jobs help support—would be a deep blow to today’s fragile economic recovery. While public-sector compensation was certainly not the cause of current state budget deficits, government employees are doing their part to help state governments cope with the sudden revenue shortfalls. State employees have taken significant cutbacks— from unpaid furlough days to job losses—and are expected to agree to take significant additional cuts to their benefits in order to balance budgets or have already done so, especially in states where budget deficits are very large. Public-sector workers are clearly prepared to play an effective and constructive role in dealing with budget shortfalls, including through the collective bargaining process. Indeed, the very function of collective bargaining is to enable negotiations on relatively equal footing between employee and employer, which in good times can be used to divide up the gains, and in bad times to share the pain. Here are several recent cases in point. Public-sector employees in North Carolina have contributed many ideas for closing budget shortfalls, with the state employee association providing two dozen ideas to reduce the state’s shortfall by $10 billion, including recommendations to consolidate state health care plans and make better use of economic development funds.8 And in California, public-sector workers have suggested reforms that are included in Gov. Jerry Brown’s budget that will save $200 million by improving the efficiency of government contracting. In Massachusetts, the state AFL-CIO has released a series of proposals that would save about $120 million in medical insurance costs for state and local governments in its first year. Similarly, the Service Employees International Union, which represents more than 1 million state and local government workers, recommends several ways to improve the efficiency of state government services to reduce spending, such as improved recycling that reduces trash-collection costs and reducing the number of steps it takes to process state payments. This kind of civic dedication harkens back to an earlier era in modern U.S. history. Back in 1975, New York City looked as though it might enter bankruptcy when it couldn’t refinance short-term debt, but that was avoided when municipal public-sector unions decided to use retirement funds to purchase city debt offerings. This effort was after city public employees agreed to wage and benefit reductions, and illustrates the kinds of creative solutions only available through collective bargaining. In this issue brief, we will detail why public-sector workers didn’t cause budget shortfalls, but they can and are working to fix state budget problems. At first glance, these arguments seem to contain a grain of truth. Forty-five states are projected to face budget shortfalls in fiscal year 2012 according to the Center on Budget and Policy Priorities. And states with higher public-sector unionization rates are slightly more likely to have larger budget deficits. But such a simple analysis misses that the Great Recession is driving state budget deficits, and states that were hardest hit by the recession have the worst shortfalls. Nevada, for example, was hit hard by the housing bubble of the past decade. The resulting deep economic downturn created a large budget deficit—and it’s hard to blame public-sector unions for a housing bubble and crash. And then there’s Texas, which has a very low level of public-sector unionization and severely restricts collective bargaining. It has one of the worst budget deficits as a share of its budget. Indeed, virtually all states— whether heavily unionized or not—face significant budget shortfalls. A closer look at the right kind of data indicates that public-sector compensation has little to do with state budget deficits. Conservatives, take note. Expenditures must equal revenues; otherwise a state faces a budget deficit. States spend money on many things, from employees to roads to building maintenance. If public employee compensation is a huge drag on state budgets, then this trend would likely show up in the data on state expenditures on government workers. If state spending on employees is really out of control, then we would expect the share of state expenditures spent on employee compensation to be very high, and would have rapidly increased in recent years, especially in states with high public-sector union participation. Yet there is very little evidence that state expenditures on employees are a problem. To examine public-sector employee compensation, we created a data set of total expenditures on state employees between fiscal years 1992 and 2009—years that include two recessions and two periods of economic growth. Wage and salary data come from the State and Local Government Finance data set at the U.S. Census Bureau. Benefits are calculated based on Bureau of Labor Statistics data on the composition of pay and benefits. 20 These are the best available data for this analysis, providing an accurate picture of total compensation for nationwide trends, even though individual state benefit data may be higher or lower than the national average. We find that in fiscal year 2009, the most recent year where data are available, average state spending on compensation as a share of total expenditures was 19.6 percent, below the 1992–2009 average of 20.7 percent. As the chart on page 1 shows, compensation as a share of total expenditures has stayed in the range of 19 percent to 23 percent over the past two decades. If state government employee compensation had suddenly overwhelmed state budgets, then a jump in compensation as a share of total expenditures would be apparent. Instead, the trend is relatively flat and declined over time. In 1992, compensation averaged 23 percent of total expenditures. That figure was 19.6 percent in 2009. This is the central finding of our analysis and bears repeating. State compensation as a share of state budgets is declining, not increasing as the conservative critique would lead one to believe. We analyzed these data in several additional ways. Each way suggests that at the very least, conservative claims are hugely overblown. For the following analysis, which includes segments of states rather than an average across all states, our data cannot provide definitive conclusions. As discussed previously, we are using the best available data, but it is only 100 percent accurate for nationwide averages. Nonetheless, it can provide some additional insights into the likely accuracy of other conservative claims. These data suggest that state compensation expenditures do not differ much by level of public-sector unionization or collective bargaining rights. For FY 2009 ending September 30, 2009, the average total compensation share for the 10 states with the lowest unionization rates was 18.7 percent. The average for the 10 states with the highest unionization rates was 19.6 percent. This is hardly a radical difference, and one that could in no way account for the average budget shortfall that states currently are projected to face of more than 13 percent of their current expenditures. Similarly, states with collective bargaining rights spend just slightly more on compensation as a share of expenditures than those states without collective bargaining rights. In FY 2009, states with collective bargaining rights spent 19.8 percent of total expenditures on compensation while states without collective bargaining rights spent 19.3 percent. Several studies show that contrary to rhetoric from some politicians, public-sector workers are not overpaid compared to private-sector workers. These studies compare public-sector workers to comparable private-sector workers, or those workers of a similar age and with similar levels of education and work experience. Controlling for these factors is essential for proper comparison. The reason: 52 percent of state employees have a college degree while just 29 percent of private-sector workers do. Instead of finding overpaid public employees, these studies find a compensation penalty for public-sector employees. A report by the Economic Policy Institute finds that state and local government workers, on average, receive 3.7 percent less in total compensation (wages and benefits) than private-sector workers. A similar study by the Center for Economic and Policy Research finds a 4 percent wage penalty for state and local government employees. Those government workers at the lower end of the education scale are slightly better off in the public sector, but workers with college degrees earn less than their private-sector counterparts. So because the public-sector workforce is more educated on average than the private sector, most public-sector workers are undercompensated. In addition, our analysis of growth in public-sector compensation over the past 20 years indicates that it has been less than the growth in the private sector. The analysis is based on Bureau of Labor Statistics data for compensation in the public and private sectors. Our analysis is overly simplistic; we do not control for potential changes in the composition of the workforce in the public or private sectors. Yet the analysis provides a reasonable overview of changes in compensation since one would expect that if public-sector compensation had truly grown out of control, then this simple analysis would indicate that growth in public-sector compensation significantly outpaced private-sector compensation. Instead, the data suggest that public-sector compensation has lagged behind the private sector. Since 1991, real average wages and benefits (after accounting for inflation) for the private sector increased by 12.43 percent while they increased by 11.42 percent in the public sector. Public-sector real benefits did grow at a quicker pace than those in the private sector (24.7 percent vs. 19.18 percent), but real wage growth was lower in the public sector (5.6 percent vs. 9.8 percent). The increase in public-sector benefits is more than made up for by slower wage growth, which means overall public-sector compensation grew at a slightly slower rate than compensation in the private sector. Teachers have borne much of the brunt of the attacks on public-sector workers. Approximately 53 percent of state and local government workers are in the education sector. They have a higher-than-average compensation due to their higher levels of education compared to the private workforce, but pay and benefits for teachers did not suddenly explode to ruin local government finances. According to Bureau of Labor Statistics data, total compensation for teachers grew at a slower rate (61.4 percent) than average compensation for the private sector (72.6 percent) over the years 1992 to 2010. The costs of public-sector pensions are often implicated in the conservative budget critique. According to this narrative, public-sector workers—and especially those who are unionized—negotiated overly generous retirement benefits that threaten to force states into bankruptcy. States have also cut back contributions to state employee pensions, increasing the shortfall by approximately $80 billion. Many states didn’t make all necessary contributions to pension plans when the stock market was booming, assuming the good times would go on forever, and when bad times hit have also failed to make necessary contributions. Moreover, the pension funding shortfall is a not an immediate crisis but rather a problem with a long time horizon. Pension plans have sufficient funds to pay all benefits for years to come but over the longer term will require some adjustments to meet all commitments. Finally, the extent of the shortfall is often overblown. Claims that public-sector pensions face a shortfall of $3 trillion assume pension funds will only earn the so-called riskless rate of return, which economists calculate in the range of about 4 percent to 5 percent. This ignores that pension funds have actually earned returns well above that riskless rate for many decades—above 9 percent since 1984—and are likely to continue to do so. More reasonable estimates of the shortfall fall between $700 billion and $1 trillion over a 30-year period. In 2000, state and local pensions, in the aggregate, were funded at 100 percent of future liabilities. The collapse of the stock market in recent years put a dent in the value of pensions but a strengthening stock market will help reduce some of the shortfall. If pensions had earned a return the same as a 30-year Treasury bond over the three years (about 4.5 percent) since 2007, then current assets would be larger by about $850 billon, or just about enough to fill the shortfall. Even with this shortfall, pensions can afford to pay 100 percent of benefits over the next 15 to 20 years. Small increases in funding from states would help offset these problems. Pensions would become solvent if state and local governments increased the funding by approximately 1 percent of their budgets or alternatively 0.2 percent of state domestic product—the total value of goods and services produced in the state—over the course of 30 years assuming no change in benefits. Despite the apocalyptic warnings of a union-fueled pension crisis bankrupting governments, simple adjustments would help close the funding shortfall. It is clear that public-sector compensation is not spiraling out of control, yet government workers will probably need to make additional sacrifices to help states with severe shortfalls balance their budgets. But if policymakers do attempt to reduce their budget deficit by cutting solely public employee compensation—rather than by considering a balanced approach of appropriate cuts in several areas of the budget and revenue increases—then the results would be large-scale job losses among public-sector workers and more pain for the overall U.S. economy. Our estimates suggest that the size of projected state budget deficits for FY 2012 ending September 30, 2012, would necessitate cutting more than 1.6 million state government jobs if compensation cuts were carried out solely as layoffs. If all cuts came by reducing wages, salaries, and benefits, then these would have to be cut by an average of 22 percent to balance the budget. The scale of these layoffs or compensation cuts would dramatically reduce the quality of public services. And for a national economy deprived of aggregate demand—in the form of spending these state-sector workers engage in every day—reducing the amount of money in workers’ pockets would weaken our already tepid economic recovery. As of February 2011, the number of unemployed Americans stood at 13.7 million. Cutting 1.6 million jobs would increase the ranks of the unemployed significantly. Government employees and public-sector unions are the folks conservatives love to tar for the unpleasant fiscal situation in state and local governments. But there is little evidence that government workers or public-sector unions are responsible for budget deficits. Employee compensation has remained a constant share of state expenditures, and state and local workers are actually underpaid relative to comparable private-sector workers. Instead, the short-term deficits are primarily the result of the Great Recession. Furthermore, claims that public-sector pensions will bankrupt state and local governments are exaggerated. There are significant budget deficits among the states. Closing these gaps on the backs of workers alone would lead to large job losses and wage reductions. David Madland is the Director of the American Worker Project at the Center for American Progress Action Fund. Nick Bunker is a Special Assistant with the Economic Policy team at the Center.